When someone does something wrong, one of the best things to do is to tell that person what he or she did wrong as well as the possible repercussions for his or her actions. This is the reason why there are warning letters that one can send to those who have committed certain violations. 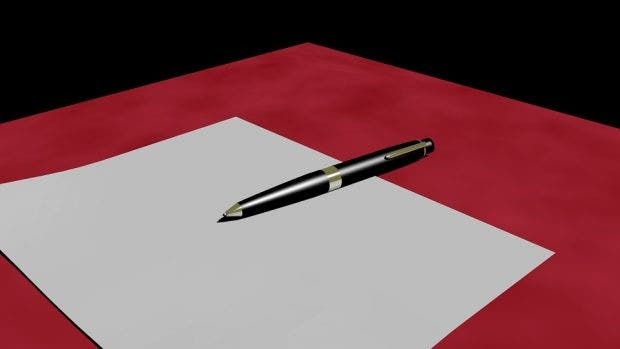 In the event that you’ve received a warning letter, then you’ll need to take a look at the purpose as to why you were handed out one and see if it’s justified, because you may have just been given a warning letter for something that you didn’t do, which is why you’ll also need to know how to properly respond to it. What Is a Job Warning Letter? Also known as a work warning letter, this is what’s handed out to employees in the event that they have violated certain company policies. 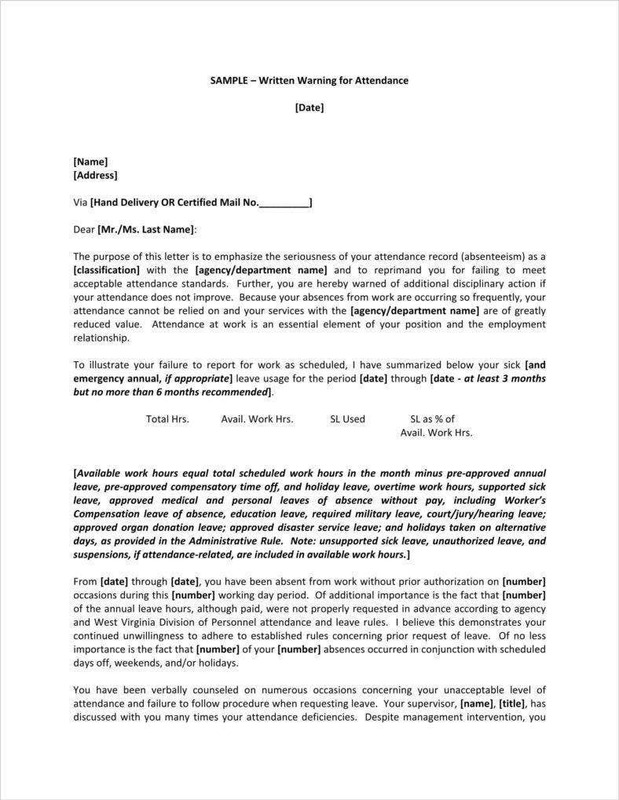 With this type of letter, employers are able to specify what the employee did to deserve the warning letter, as well as pointing out what he or she needs to do in order to shape up to become someone that the company needs. So long as the violation isn’t enough to get the employee terminated immediately, then send him or her a warning letter that warns the employee regarding his or her fate within the company. You’ll need to know if the situation actually calls for you to write the letter. Every company has different methods of handling employees who may become a problem. And all of them have different protocols depending on the severity of the situation. A lot of companies usually start with the employee receiving with a couple of documented verbal warnings, then it’ll move on to a written warning, then a final written warning, and if the employee still has not mended his or her ways, then the employee may be terminated. Giving regular positive or negative employee feedback based on their significance is important so that when they receive the letter, it won’t come as a surprise. So if the employee has been underperforming to the point where it’s hindering business operations or if the employee has been behaving in a way that continuously hinders the work of others, then you may choose the option to hand over the letter, which tells the employee that he or she has is failing to meet expectations. You’ll need to identify all of the common problems that occur within your company. There a lot of problems that happen too often where the employer is required to make and send the warning letter. The problem of attendance is very common among just about every business. At the end of the day, showing up matters because by showing up, you might actually do something rather than nothing. Other problems that force employers are required to write these letters are when certain employees mistreat coworkers, dressing inappropriately, communication that the company might deem inappropriate, and much more. However, the problem that’s more common than any of these is the quality or the quantity of the employee’s output. If the problem is a skill that the employee is lacking, then you can help that person by putting him or her through employee training rather than termination. The reason for this is because it’s more expensive to fire employees rather than training them. So if the problem is really big as well or has been going on one too many times, then you can send them these warning letters. You’ll need to document every single verbal warning that you’ve made to the employee. Although keeping track of them may be a chore, it’ll be useful for you in the event that you’ll have to remind the employee of what you’ve told them and when, and it’ll also help you if it ever comes to a lawsuit. 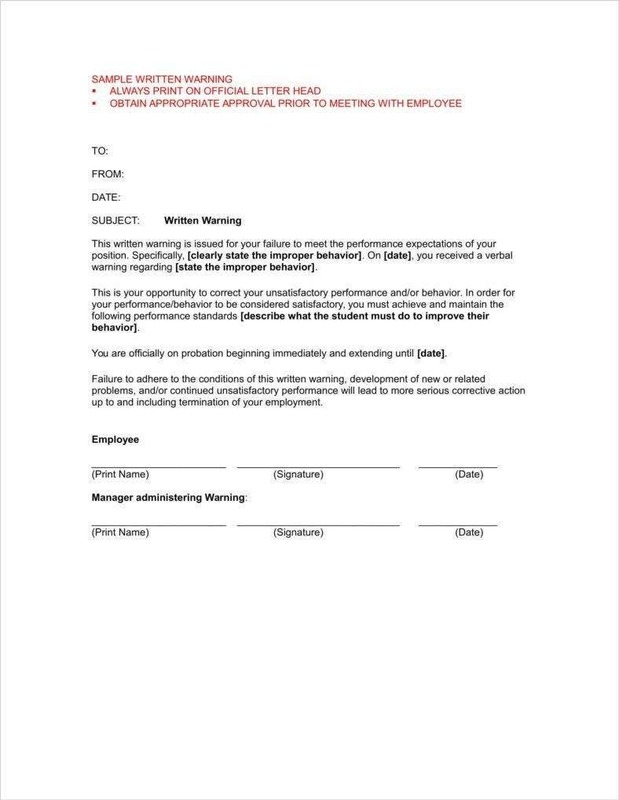 When you’re in the stage where you’ll have to write the warning letter, you’ll want the employee to sign somewhere on the letter that confirms that the employee has received the letter and that they’ve agreed and understood the conditions. When writing a warning letter, what you’ll need to do is that you need to outline the employee’s conduct prior to the warning that was unacceptable and you need to identify that conduct that you expected out of the employee. It’s important for you to be as specific as possible when you’re reprimanding the employee verbally and through the warning letter. 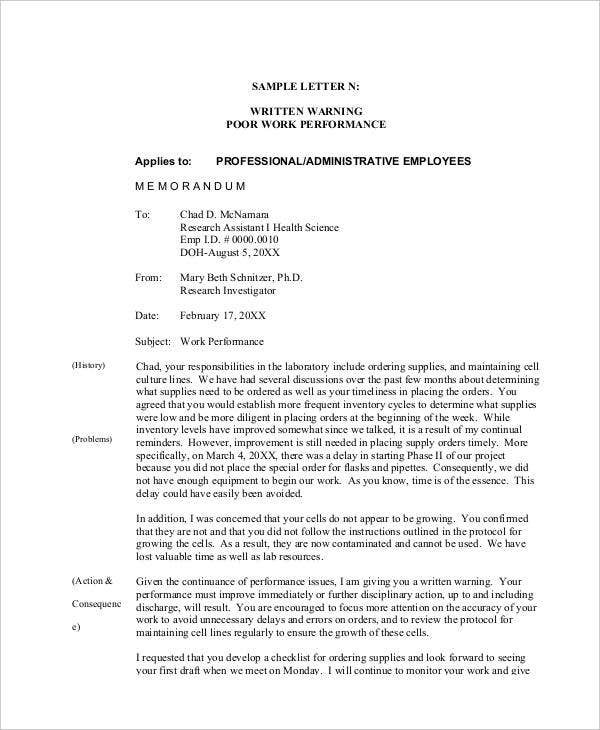 The tone of the warning letter can also be dramatic depending on the type of infraction the employee has committed. 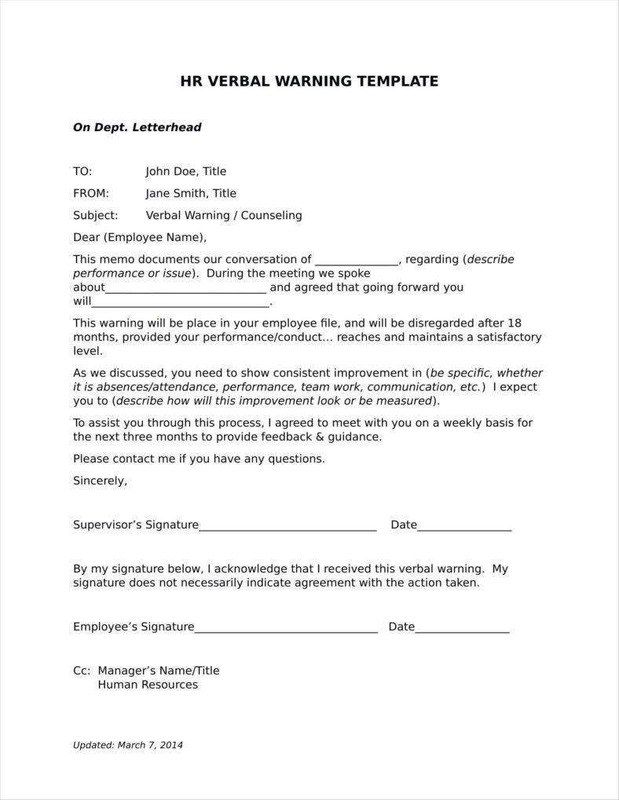 You may either create a formal letter that’s more on improving the employee’s performance or one where you document that you have to let the employee go. Once you’ve written the warning letter, you cannot just leave it at the employee’s desk or send it via e-mail. What you’ll need to do is to accompany it with an in-person conversation. Doing this allows you to discuss with the employee regarding the contents of the letter as well as letting the employee comment regarding how he or she feels about it. You’ll need to make sure that the conversation is private because there are some employers who have a hard time keeping their temper in check and might accidentally humiliate the employee. You can also soften the blow of the warning letter with positive feedback. A clear statement regarding the problem or the performance issue that the employee has to improve on. As said before, you’ll want to be as specific as possible so that the employee will know what he or she has to fix. The letter must contain several examples of ways that the employee can change his or her performance and/or behavior to comply with the company’s expectations. Doing this should at least give the employee an idea on how to do better so that he or she will be able to meet these expectations. The kind of impact the employee’s underperformance has within the workplace as well as the company’s success. If you wish, then you can provide a time limit in which the employee must improve his or her performance. This is very important during those times where the employee has become more of a liability rather than an asset and where the employee has to prove that he or she still has value to the company. 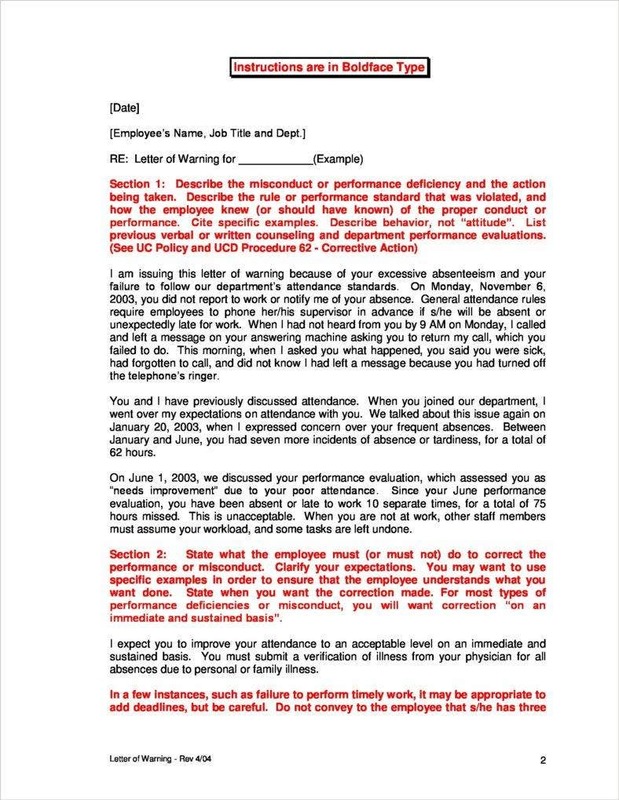 A clear and effective statement regarding the consequences that the employee should expect in the event that his or her performance has failed to improve as described in the warning letter. Sometimes it’s necessary to instill fear in the employee if he or she is unwilling to meet the company’s expectations. The letter will require the signature of the employee’s supervisor or even the company’s chief executive officer. 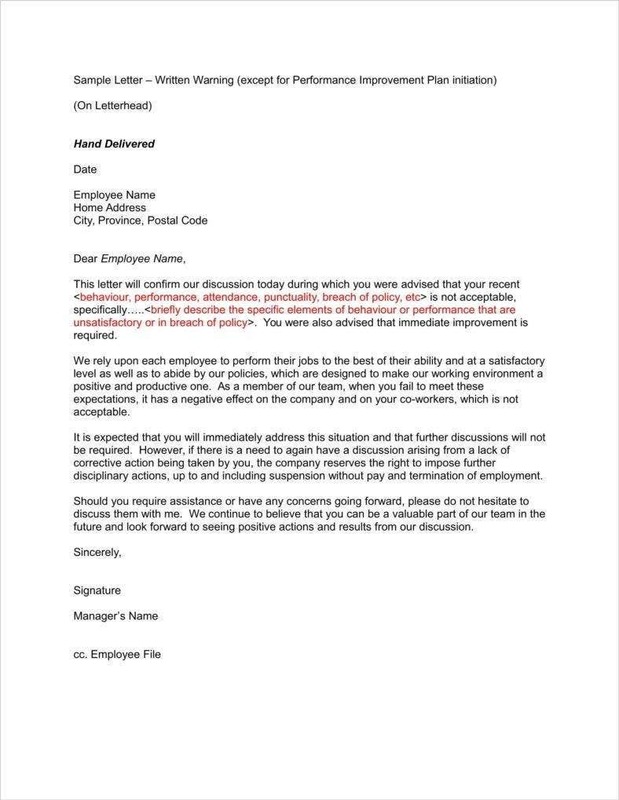 By gathering these signatures, it’ll show the employee that the decision to give the letter wasn’t just from you, but it’s also through the support of other higher-ups. The signature of the employee to whom the warning letter is assigned to. What the letter should contain is a statement that the employee’s signature represents that he or she has received the letter. Even if the employee disagrees with the contents, you’ll need to gather their signature to ensure that they have given confirmation regarding the contents of the letter. 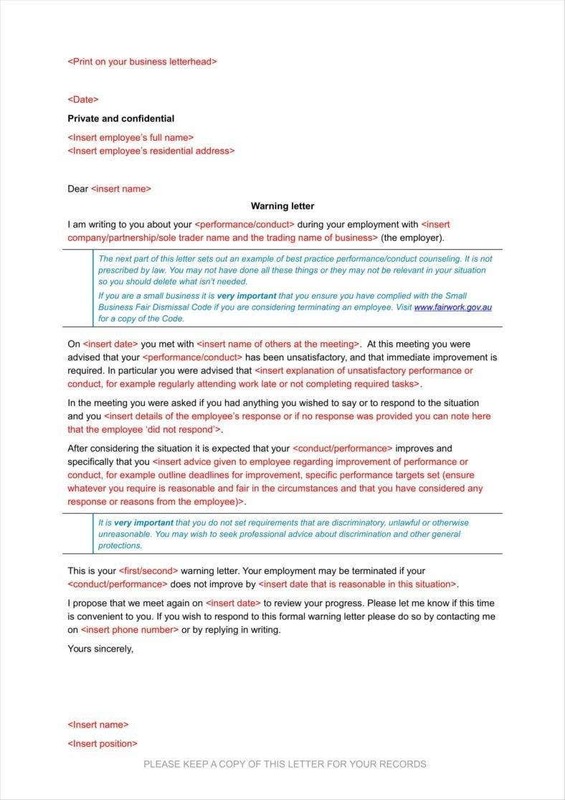 An opportunity for the employee to object in writing as to the letter’s contents. The employee is allowed to express if he or she agrees, disagrees, express frustration are just about anything else within his or her written response. 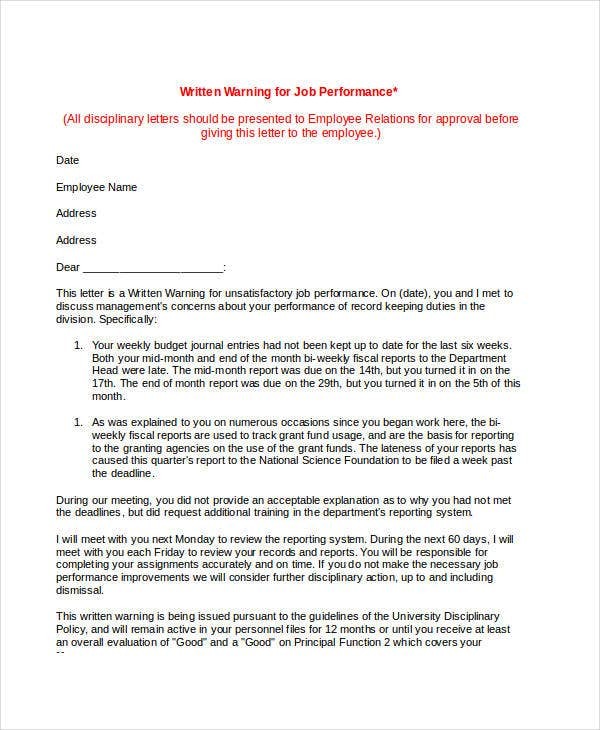 Any rebuttal that the employee may have must be attached to the original job warning letter. While it’s never easy to reprimand employees, there will always come a time where it’s absolutely necessary that you do. 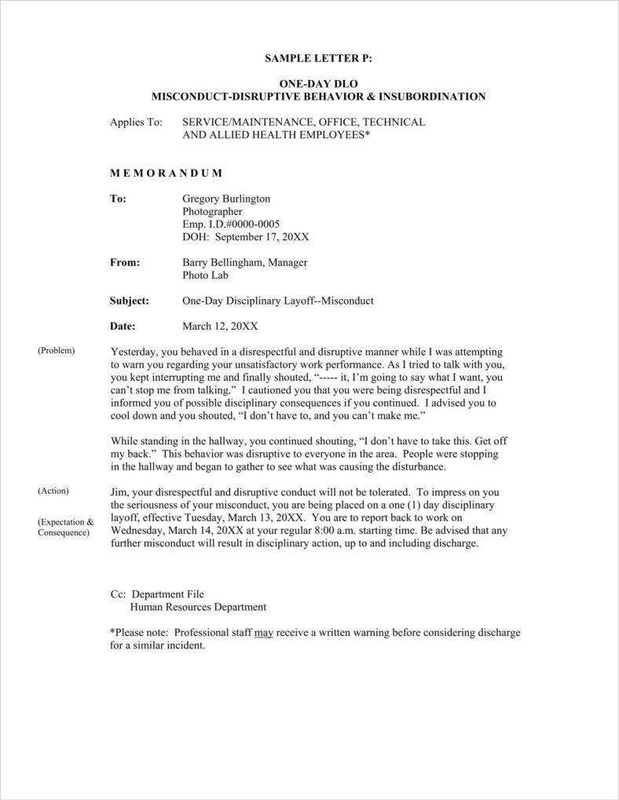 Which is the reason why employers need to learn how to write and hand over these letters so that these employees know that they’re just one step away from being fired. 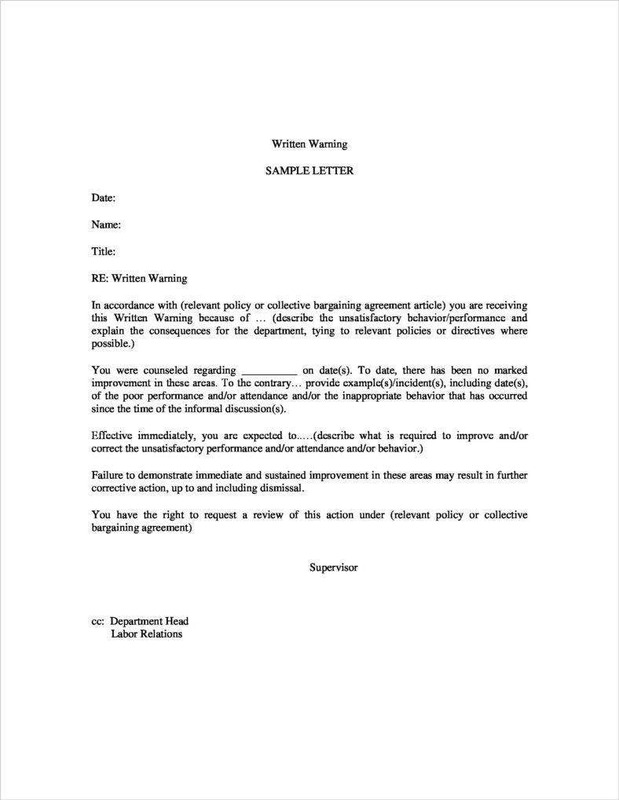 So if you would like to know how to write other types of warning letters, then you may view any of our available warning letter templates to give you what you need.